In the first of a two-part video lesson, Alexi 'Wildchild' Laiho demonstrates some of the warm-ups he uses to get his hands ready to play with Children Of Bodom. 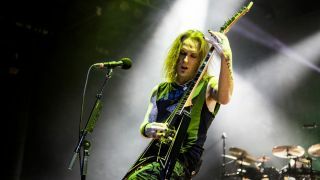 It's no secret that Alexi Laiho is a technically gifted guitarist, and with his band Children of bodom, he continues along a path as one of the all-time greats of melodic death metal. As a virtuoso he puts the tools of his trade - his hands - on the line every time he gigs so it's pretty important that he has a decent warm-up routine. We picked the Wildchild's brains to get the lowdown on his pre-show practice sessions and we've tabbed out what he showed us for you. There's plenty more to follow next month, so stay tuned! You may be surprised to learn that Alexi's exercises are, in the main, quite accessible; even less experienced players should be able to make use of his practice routine. We'd suggest that this is what makes the perfect warm-up: short, simple phrases that you can move around the fretboard as you like. Play through Alexi's exercises at a comfortable tempo and focus on accuracy and clarity before you attempt to play faster. Alexi's first warm-up is quite the challenge thanks to some tricky position shifts. Perhaps not an ideal starting point then, but fear not! Just tackle each four-note phrase on its own and you have a great set of repeatable exercises that anyone can attempt. Remember to focus on steady 'down up down up'-style alternate picking. Here Alexi develops his single-string lick over two strings. With no position shifts this is an easy line that will develop both picking and fretting skills. This lick is played the same as the previous one but moved down a string. A bluesy b5th interval on the third string makes for a more musical practice session. This lick combines the previous two into one longer line. It's here that you may fall foul of the string changes; some are played with downstrokes and some with upstrokes. So keep your timing steady and try to make every pick stroke the same, both in terms of how hard you play and how far your pick moves. This four-note pattern uses 'inside the strings' picking, which means that your pick stays between the strings in question and doesn't hook around them. All you have to do here is pick 'down up down up' continuously. The more challenging alternative is 'outside the string' picking whereby you reverse the pick directions. This exercise further homes in on 'inside the strings' picking and focuses purely on two notes. Try the inside approach (down up down up), then, for a challenge, switch to the 'outside' (up down up down). There's no great secret. In real life solos you'll approach strings from either direction. This exercise simply helps you hone both skills. The beauty of this stretching exercise is that it can be as easy or as tough as you like. For a gentle warm-up, use either your first and third or first and fourth fretting fingers. For a challenge use your first and second, second and third, or, if your hands are made of pure elastic, your third and fourth fingers. Stop if you feel discomfort. This exercise is for more experienced players because the only way to make it easier is to move higher up the neck where the frets are closer together. The numbers next to the note heads are TG's finger suggestions. Depending on the length of your fingers you may prefer to use your third finger rather than your second. Like most of Alexi's exercises, this legato line is achievable for all but absolute beginners. It boils down to just six notes, which you can repeat until your fingers get tired. 'Legato' means that you use hammer-ons and pull-offs. We suggest picking once per bar, but why not see how long you can keep the lick going without picking? This lick starts on the same six-note pattern as the previous example but descends the strings, varying the pattern along the way. As you move from string to string, either initiate each one with a pick stroke or hammer-on with a fretting finger. Keep picked notes gentle so that your legato notes don't sound too soft in comparison. Alexi rounds off this month's exercises with a more challenging line that ascends the fretboard. You'll need fast, strong movements from your fourth finger to hit the first note of each grouping bang on time. If this exercise is a challenge for you we recommend practising each six-note phrase on its own.